Today on belly, a man who is regularly spoken of as a local legend, not because he is not actually part of our everyday reality (we do operate on several plains here in the Rainbow Region), but because once you meet the man, his food, and his handmade dosa stand, you will never forget him. And you will search him out and his delicious life enhancing food. Russell the dosa man will share some stories and a recipe or two, then we talk about some other legends – those tough and exacting country show judges, and the people who regularly come away with the winners’ ribbons. Slices and chutneys and iced Vo-Vos and all those old fashioned things, also many new and surprising bits of show cookery and many stories of fascinating country shows and cooks in Liz Harfull’s “THE AUSTRALIAN BLUE RIBBON COOKBOOK”. Sister D. talks with Liz on belly today. Pongal is an every day delight in South Indian eating houses . It is served at the same time of day as Dosa , Iddly and many other small treats . I find it very nourishing and take great delight in its curry leaf / peppercorn / cumin combination together with fresh roasted cashews ……not forgetting lashings of ghee . I have experimented with a vegan alternative and have found that an abundance of organic macadamia oil and nuts is equally enjoyable . Rinse the dal and rice well and cook together with about 8 cups of water in a heavy bottomed pot with a lid . Give it a good stir as it comes to the boil then cover and simmer for about 45 minutes keeping an eye on the water level and stirring again only towards the end . It is best to avoid burning on the bottom . Add boiling water if necessary. whilst the rice and dal cooks , gently fry the cashew nuts in some ghee or oil till they start to take colour and put them to one side …. into the same ghee or oil fry the cumin till it changes colour , add peppercorns , stir a few times then add the curry leaves ( which will splutter ) and ginger, stir again for a minute or two then add 1/2 a cup of water with salt . Simmer for a couple of minutes then when rice and dal are cooked fold everything together including cashews and the rest of the ghee or oil . 1. Place the butter and sugar in the top of a double boiler and heat slowly over simmering water, stirring continuously until the butter melts. 2 . Combine the passionfruit pulp with the beaten eggs. Pour them into the butter mixture, whisking constantly until it is smooth and thick enough to coat the back of the spoon. 3. 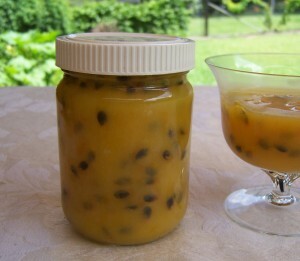 Pour the passionfruit butter into small, hot sterilised jars and seal immediately. You must not cook the mixture over a direct heat and do not allow it to boil or it will curdle. The butter will only become really thick when it has cooled. Make the passionfruit butter in small quantities as it will only keep for a few weeks. Always store it in the fridge. The butter should be smooth, with a creamy texture and the distinctive tang of passionfruit. It must be of spreadable consistency and not too runny. Consider straining the beaten eggs before adding them to the mixture to make sure they are well beaten and to avoid flecks of egg white in the butter.